The Latin name Artemisia dranculis is a member of family of tarragon tea Asteraceae (chamomile). The Latin name means “little dragon”, but it is not known given why this name. The length may vary between 60 cm and 120 cm. It is an annual bush plant with a sharp and fragrant smell. It has thin, long and bright green leaves. It has small and greenish white flowers. It is generally grown as a suitable spice for kitchen use, but adds flavor and smell to dishes as well as is a medicinal plant. Especially in Europe, “king of plants” known as tarragon plant is one of spices used to sweeten food all over the world, especially French cuisine. Especially in Europe, “king of plants” known as tarragon plant is one of spices used to sweeten food all over the world, especially French cuisine. Tarragon herb, a sweet aroma, is very rich in antioxidants, minerals and vitamins. Manganese includes iron, calcium, magnesium, phosphorus and potassium minerals, vitamins C, A, riboflavin, niacin, B6 and folate. What Are Benefits Of Tarragon Tea? Tarragon tea is traditionally used for various discomforts and health problems ranging from tooth ache to snake bites and parasitic infections in many different cultures worldwide. Can be used for insomnia. Used in fight against intestinal parasites. Tarragon plant is very rich in calcium, copper, iron, magnesium, manganese and zinc. In addition, it contains electrolytes such as sodium and potassium. Vitamin A, vitamin C, as well as many common vitamins such as folate, Niacin, Pyridoxine, Riboflavin contains vitamins. It also contains protein and carbohydrates. • It is usually produced as a spice and used in kitchen. It is possible to add flavor to soups, to make pickles or to consume as a salad. Since has a very intense and sharp taste, is not recommended to use too much in quantity. • Tarragon oil is also widely used in alternative medicine. 1. Tea Sleep with Tarragon: After boiling a cup of water add 1 teaspoon tarragon, 1 teaspoon passionflower, three head chamomile, 3 leaves lemon balm, 1 teaspoon lemon grass. Cover top and leave to infuse for 5 minutes. You can consume your tea warm or warm after filtering. This will ease your transition to sleep by reducing your tea tension. 2. Tea Appetite with Tarragon: Add 1 teaspoon of tarragon, 1 teaspoon of St. John’s wort, 1 teaspoon of cinnamon, 1-2 pieces of turmeric 1 glass of boiled water. Cover top and leave to infuse for 5 minutes. You can add honey or a few drops of lemon juice on request. Tarragon tea will help you overcome problem of malnutrition. 3. Tarragon Tea for Migraine: After boiling a glass of water, add 3 slices of fresh ginger and boil for another (1 or 2 minutes). After taking ginger water from stove, add 1 teaspoon of tarragon and 3-4 pieces of medical daisy and brew for 4 minutes. You can drink warm or hot after filtering your tea. 4. Recipe Tarragon Tea for Parasites: Materials required for 1 cup: 1 teaspoon tarragon, 1 teaspoon thyme, 3 head daisy and 1 tooth clove. After boiling water into clove and boil for a minute, then add tarragon, thyme and chamomile to cover. This way you can consume your tea warm or warm after 5 minutes demleyeip. Tarragon tea will help you get rid of intestinal parasites. How to Prepare Tarragon Tea? For 1 large teacup, 1 teaspoon dry tarragon is sufficient. After boiling water, pour on top of tarragon put in glass and let stand for 3-4 minutes. If you are going to prepare tea from fresh tarragon, you may need to use 1.5-2 teaspoons to get full aroma. You can add 1-2 thin slices of ginger or 3-4 leaves of mint to tarragon tea. As tarragon is a sweet flavored plant, extra sweeteners are not needed, but if you want to sweeten, you can use 1 teaspoon of honey. ✔ Tarragon grass, also known as “Dragon plant”, is divided into 3 main categories as French, Russian and Turkish tarragon (Artemisia dracunculus), but characteristics of these plants are very close to each other. ✔ French tarragon has a stronger flavor and is more preferred in meals, but Russian tarragon has a lighter aroma. ✔ The use of tarragon grass for health purposes other than meals dates back to ancient times, but number of studies on this subject is not much. 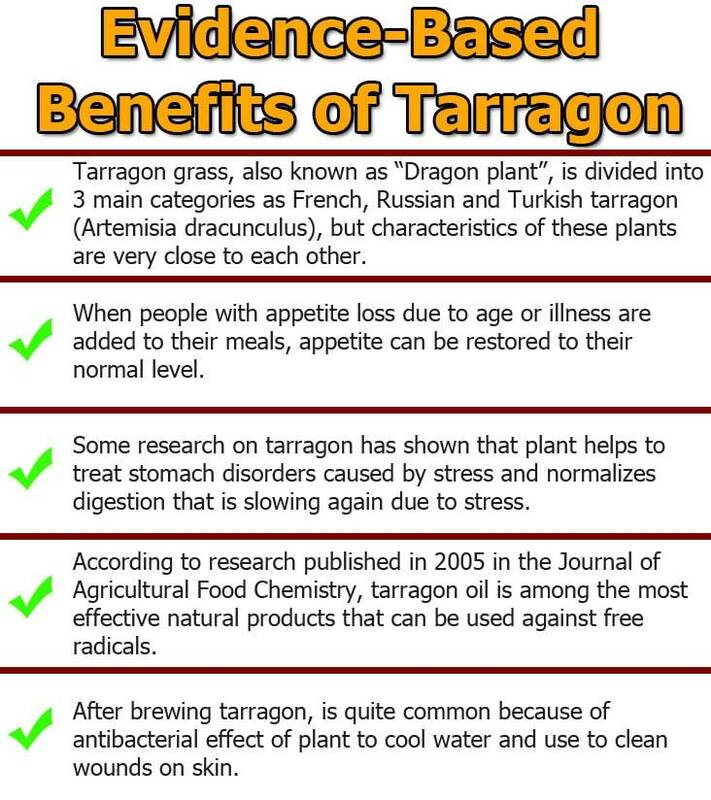 ✔ According to results of a research published in journal “Diabetes” in 2010, tarragon opens appetite. ✔ When people with appetite loss due to age or illness are added to their meals, appetite can be restored to their normal level. ✔ Some research on tarragon has shown that plant helps to treat stomach disorders caused by stress and normalizes digestion that is slowing again due to stress. ✔ Tarragon, especially Turkish tarragon, is rich in antioxidants and provides protection against free radicals damaging cell structure. ✔ According to research published in 2005 in the Journal of Agricultural Food Chemistry, tarragon oil is among the most effective natural products that can be used against free radicals. ✔ After brewing tarragon, is quite common because of antibacterial effect of plant to cool water and use to clean wounds on skin. 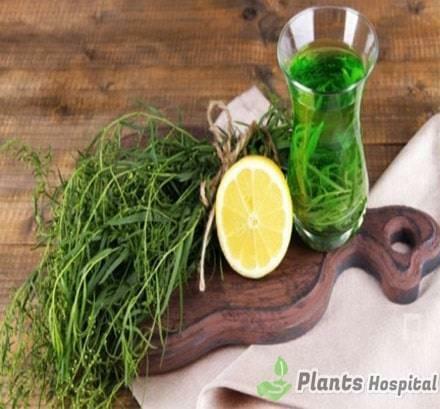 As with any herbal product, is recommended that you consult your doctor before starting to use tarragon plant for treatment or support purposes. It is not recommended to consume extra amounts of tarragon other than meals during pregnancy and breastfeeding. Chamomile, marigold, chrysanthemum, ”asteraceae, compositae aster can cause allergic reactions in people who are sensitive to family. 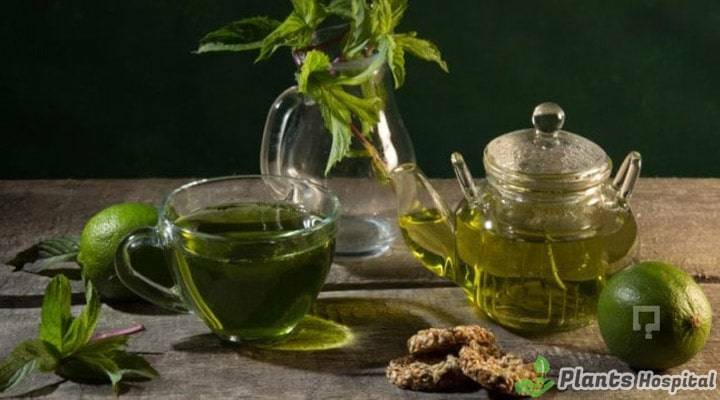 Tarragon, or tarragon tea, which is consumed in regular ratios with food, is shown to be useful for long term consumption of tarragon excessive amounts of tarragon can trigger serious diseases due to estrogae chemical found in plant.